The shovel on the back of my Lightweight appears to have been replaced at some time. I would like to get the correct shovel with the "T" handle. 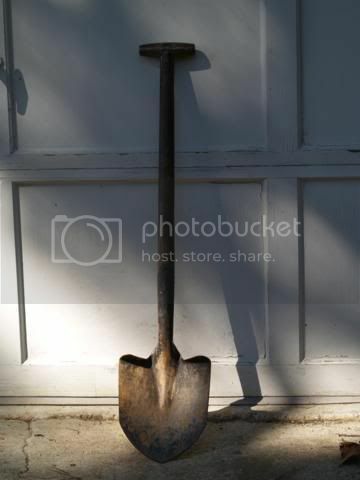 Does anyone know where to get the proper shovel? Has anyone used the Carter's shovel that RN sells? Does it fit properly on the Lightweight? Any pictures of it mounted? I'm wondering how it fits the existing brackets. No, this is mine, it's a full size shovel. ^^That's what I'm looking for! Any pictures of it mounted? I checked both sites you mentioned, but can't find it on either. Maybe I'm not looking hard enough. There are two sizes. The one in the pic provided by A.C looks to be the long handled version. I think you need the short handled version to mount on your gate. The short handle is for use on the front of the 101FC. The longer handle is used on the rear of the lightweight. I got mine from a guy in Billings, Montana. He sells surplus stuff. It's not the correct shovel but it is British Military and dated 1950's. Looks and fits the part but I did have to modify my bracket a bit to make it line up. $19+$11 shipping. Anchor supply has the genuine articel but make sure to order the larger shovel. Who were the manufacturer of the original Land Rover series shovels? Good question. The head of my shovel appears to be original based on the many layers of military paint. I found a "MF" logo stamped on it when I sandblasted it.